On this date in 1396, Ottoman Sultan Bayezid I put thousands of Christian Crusaders to the sword — and with them, Christians’ zest for holy war against the Turk. 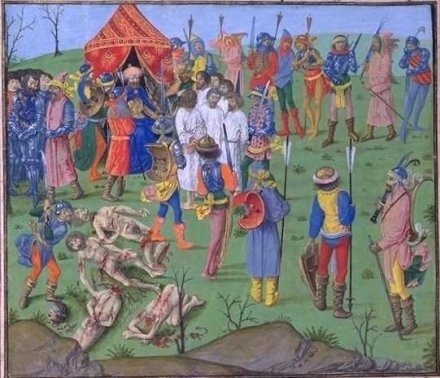 The day after crushing a European Crusading expedition at the Battle of Nicopolis — where Christ’s multinational divisions might have crippled themselves by opting for political reasons to go with gloryhounding French knights’ demand for a heavy cavalry charge as opposed to sneakier tactics — Bayezid was mighty sore to find that the invaders had executed en masse Muslim prisoners from their last engagement. The defeat was followed by a frightful sequel. As Bajazet toured the battlefield … he was “torn by grief” at the sight of his losses, which outnumbered the Christian. He swore he would not leave their blood unavenged, and the discovery of the massacre of the prisoners of Rachowa augmented his rage. He ordered all prisoners to be brought before him next morning. … [T]he leading nobles … were … spared [for ransom], as well as all those judged to be under twenty for forced service with the Turks. The rest, an uncertain figure of several thousand, were marched naked before the Sultan, bound together in groups of three or four, with hands tied and ropes around their necks. Bajazet looked at them briefly, then signed to the executioners to set to work. They decapitated the captives group by group, in some cases cut their throats or severed their limbs until corpses and killers alike were awash in blood. [The Christian nobles being spared] were forced to stand by the Sultan and watch the heads of their companions fall under the scimitars and the blood spurt from their headless trunks…. The killing continued from early morning to late afternoon until Bajazet, himself sickened at the sight or, as some say, persuaded by his ministers that too much rage in Christendom would be raised against him, called off the executioners. In truth, the era of the Crusade as most readily conceived — a bid to conquer the Holy Land — was long past by this time. But it had been under that tattered old banner that Christendom summoned its vassals to check the rising Ottoman Empire, which by this time had reduced Byzantium to a rump state around Constantinople. The battle that precipitated this day’s* feast of carrion occurred in Bulgaria, where the Turks’ growing European footprint (and this affair essentially pinched out the Bulgarian Empire of the day) exercised the European courts in figurative as well as literal ways. Though other ventures would hoist the crusading pennant, there would be no major offensive incursions against the Turks until “crusades” had fallen well out of fashion. None of this gory affair is to be confused with Indiana Jones and the Last Crusade, where a leap of faith proved more felicitous. * Most sources place the Battle of Nicopolis at September 25, although some say September 28 — the latter date would obviously place this massacre on September 29.